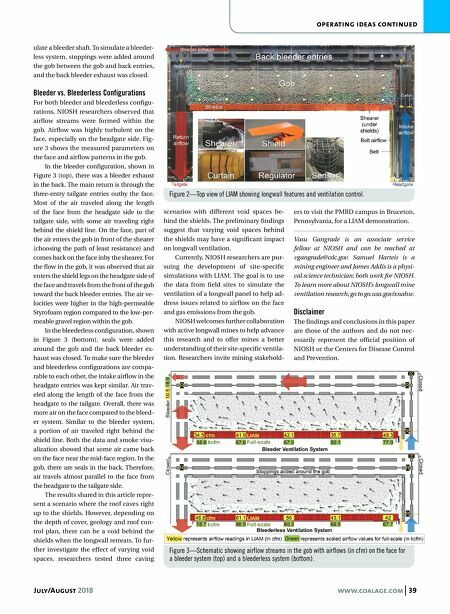 38 www.coalage.com July/August 2018 operating ideas Studying Longwall Ventilation With Physical Modeling by vasu gangrade, samuel harteis and james addis Ventilation is the primary method for con- trolling gas and dust during longwall min- ing. It is not only important for controlling dust particulates, but also for maintaining permissible levels of methane. Historical- ly, most methane-related mining disasters occurred or originated at or near the active production or development faces. More recently, methane ignitions and explosions have occurred in mines using the longwall mining method. Therefore, designing and maintaining an efficient ventilation system for a longwall mine is of utmost importance for mine opera- tors. However, the complex and dynamic nature of coal mine ventilation systems makes it difficult to conduct accurate and detailed field assessments. 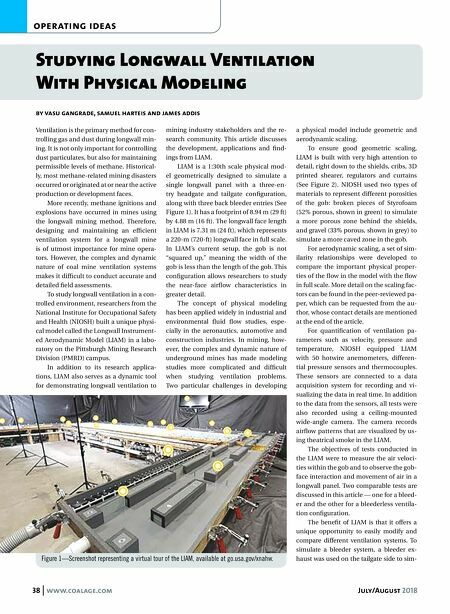 To study longwall ventilation in a con- trolled environment, researchers from the National Institute for Occupational Safety and Health (NIOSH) built a unique physi- cal model called the Longwall Instrument- ed Aerodynamic Model (LIAM) in a labo- ratory on the Pittsburgh Mining Research Division (PMRD) campus. In addition to its research applica- tions, LIAM also serves as a dynamic tool for demonstrating longwall ventilation to mining industry stakeholders and the re- search community. This article discusses the development, applications and find- ings from LIAM. LIAM is a 1:30th scale physical mod- el geometrically designed to simulate a single longwall panel with a three-en- try headgate and tailgate configuration, along with three back bleeder entries (See Figure 1). It has a footprint of 8.94 m (29 ft) by 4.88 m (16 ft). The longwall face length in LIAM is 7.31 m (24 ft), which represents a 220-m (720-ft) longwall face in full scale. In LIAM's current setup, the gob is not "squared up," meaning the width of the gob is less than the length of the gob. This configuration allows researchers to study the near-face airflow characteristics in greater detail. The concept of physical modeling has been applied widely in industrial and environmental fluid flow studies, espe- cially in the aeronautics, automotive and construction industries. In mining, how- ever, the complex and dynamic nature of underground mines has made modeling studies more complicated and difficult when studying ventilation problems. Two particular challenges in developing a physical model include geometric and aerodynamic scaling. To ensure good geometric scaling, LIAM is built with very high attention to detail, right down to the shields, cribs, 3D printed shearer, regulators and curtains (See Figure 2). NIOSH used two types of materials to represent different porosities of the gob: broken pieces of Styrofoam (52% porous, shown in green) to simulate a more porous zone behind the shields, and gravel (33% porous, shown in grey) to simulate a more caved zone in the gob. For aerodynamic scaling, a set of sim- ilarity relationships were developed to compare the important physical proper- ties of the flow in the model with the flow in full scale. More detail on the scaling fac- tors can be found in the peer-reviewed pa- per, which can be requested from the au- thor, whose contact details are mentioned at the end of the article. For quantification of ventilation pa- rameters such as velocity, pressure and temperature, NIOSH equipped LIAM with 50 hotwire anemometers, differen- tial pressure sensors and thermocouples. These sensors are connected to a data acquisition system for recording and vi- sualizing the data in real time. In addition to the data from the sensors, all tests were also recorded using a ceiling-mounted wide-angle camera. The camera records airflow patterns that are visualized by us- ing theatrical smoke in the LIAM. The objectives of tests conducted in the LIAM were to measure the air veloci- ties within the gob and to observe the gob- face interaction and movement of air in a longwall panel. Two comparable tests are discussed in this article — one for a bleed- er and the other for a bleederless ventila- tion configuration. The benefit of LIAM is that it offers a unique opportunity to easily modify and compare different ventilation systems. To simulate a bleeder system, a bleeder ex- haust was used on the tailgate side to sim- Figure 1—Screenshot representing a virtual tour of the LIAM, available at go.usa.gov/xnahw.